Warhammer Underworlds: Nightvault continues the story that was set up in its first season Shadespire. Shadespire, the mirrored city, is trapped in a limbo between the Realm of Shadows (Ulgu) and the Realm of Light (Hysh), by a curse from Nagash. Several factions of the Age of Sigmar world fight within the city, with different motivation. Some try to escape the never ending nightmare the city is, others seek for treasures or are just attracted by the bloodshed. Back in the day, when Shadespire was a city of wonder and magic, they had their own dungeon, to contain all the enemies of the city and all threat was locked away in the Nightvault. Enraged by beauty of the city, Nagash cursed the city and broke the chains of the Nightvault, releasing all that was entrapped into the streets of Shadespire. So much for the lore. But what does this mean game or product wise. The underworld series is set up as a competitive and compact game. As mentioned in the review of Shadespire itself, this appeals to both, veterans and newcomers. 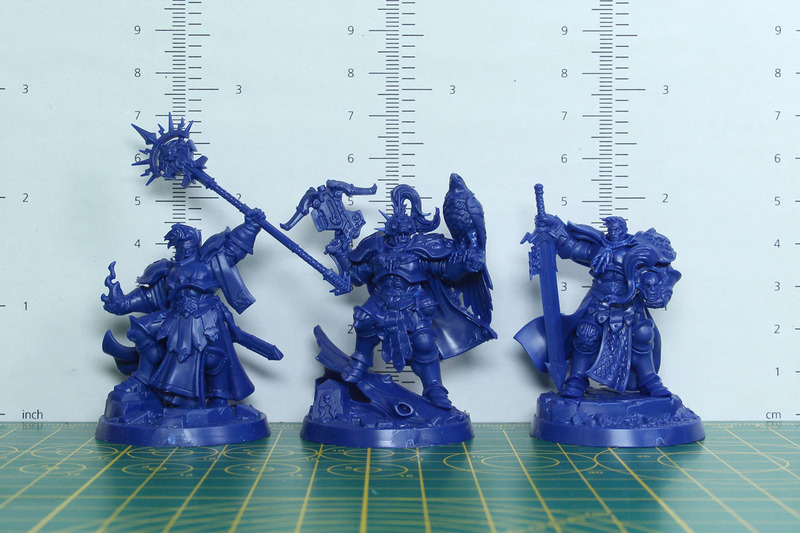 A warband, of which two are included in each of the starter boxes, contains of a fixed number of miniatures and is self-contained. The matches are played fast, you could easily play 3 or more in the time you would play other (larger) wargames and it does not take up much space. 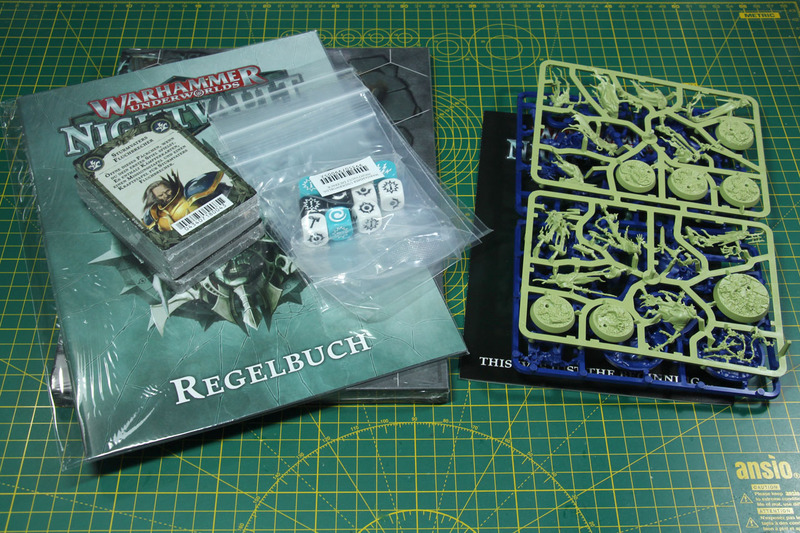 So if you are either dipping your toes into new water with wargaming, or are already familiar with the hobby but lack the time for larger rule sets, this is worth a look. As for the competitive note of Underworlds. You can play the game casual with the pre-set card decks, or you can build up your own, more complex and redefined decks, using the cards from the boxes and warbands. The Underworlds website provides a card library as well as several deck builds to support the player with this. The Underworld series has a high quality look and feel to it. The box the game comes in is a proper glossy hard cardboard box. Solid and protective for its contents. 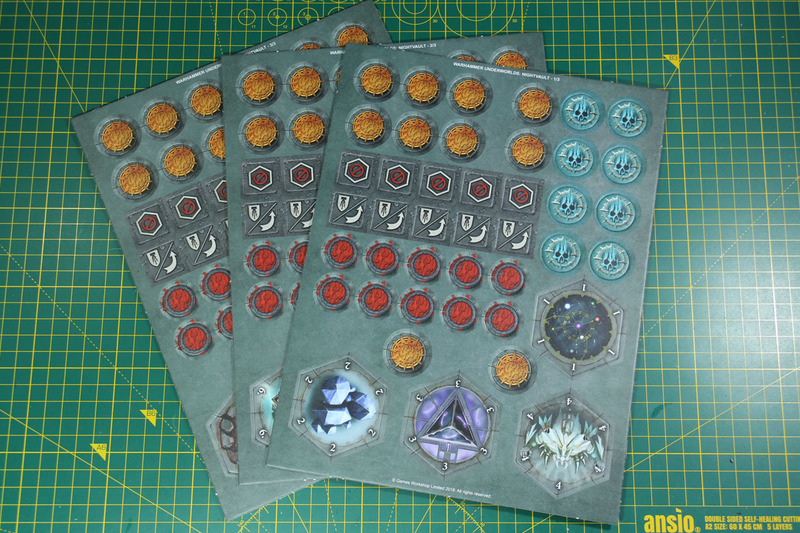 All the game resources are made especially for the Underworlds series and not just a couple of sprues they already had and an A5 leaflet thrown on top. The dice and miniatures are casted in a proper way. The cards as well, appealing artwork and properly designed. The first card of each of the pre-assorted decks had some damage on its edges, but as they only have a protective / introductory role and you throw them away after unpacking, that is no real problem. 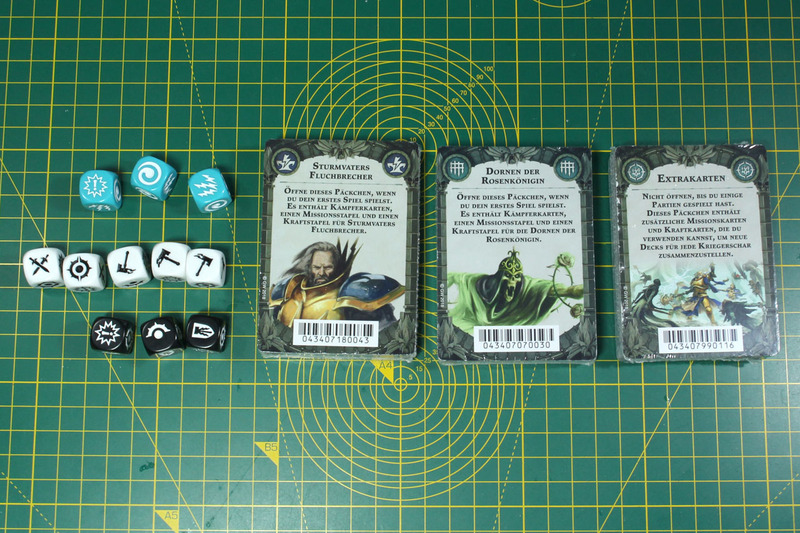 In addition to the 8 combat dice (5 white attack dice, 3 black defense dice), there are three light blue dice for the use of the new magic powers of Nightvault. Similar to the Shadespire boxed set, you receive a pre-assorted deck for the Stormcast Eternals warband – Stormsire’s Cursebreakers and the Nighthaunt warband – the Thorns of the Briar Queen, as well as a third deck with more cards to mix in the decks after your first initial matches. Nightvault introduces a new type of cards as well, the magic spells. The two game boards are double sided (with different motives) and have 5 by 8 hex fields, along with half hex fields on the edges that are completed by aligning them with a second game tile. 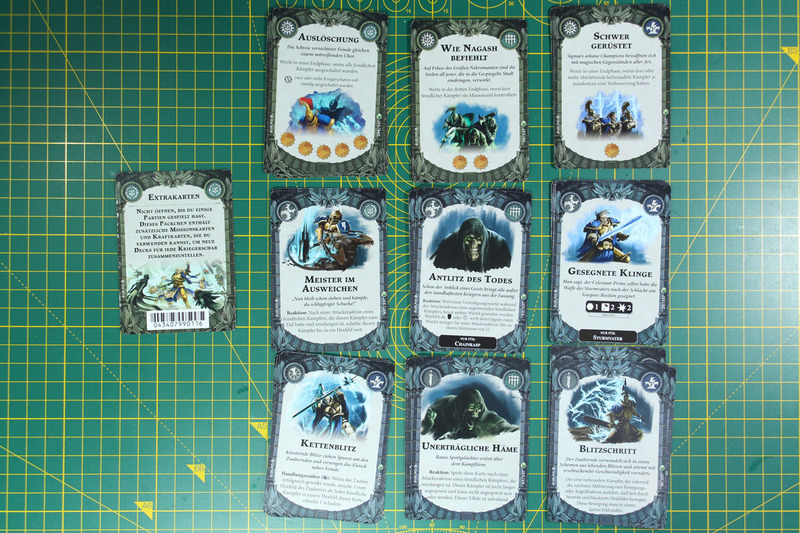 These are new designed boards and even cover dangerous hexes, originally introduced in the Shadespire supplement board tiles. You can see the game tiles in action further below. The cards are kept in the same design as the original ones, but you can distinguish them from each other by the small print. 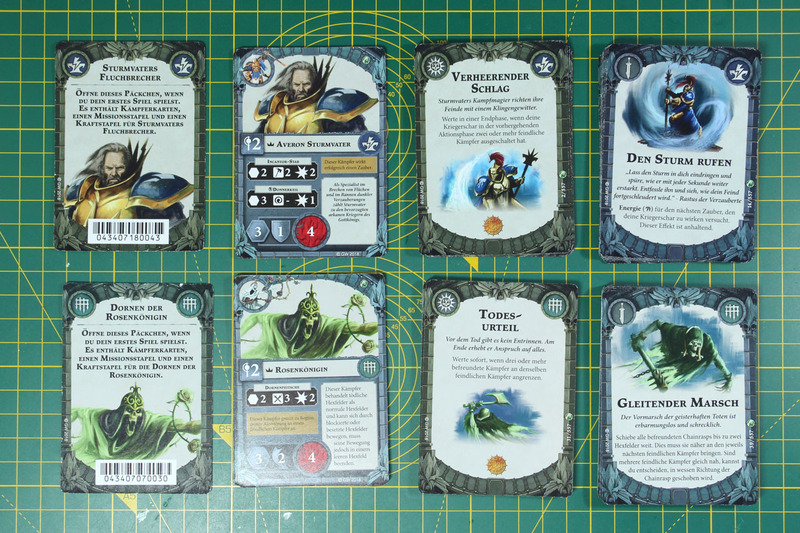 Similar to the labelling of trading cards, they have a small icon on the lower right side, sporting the icon of the edition and a number. As you can see, Nightvault will cover almost 120 more cards than Shadespire. But that will be mostly due to the fact, that the two warbands of Steelhearts Champions and Reavers will receive a re-release / re-print as individual warbands for Nightvault. 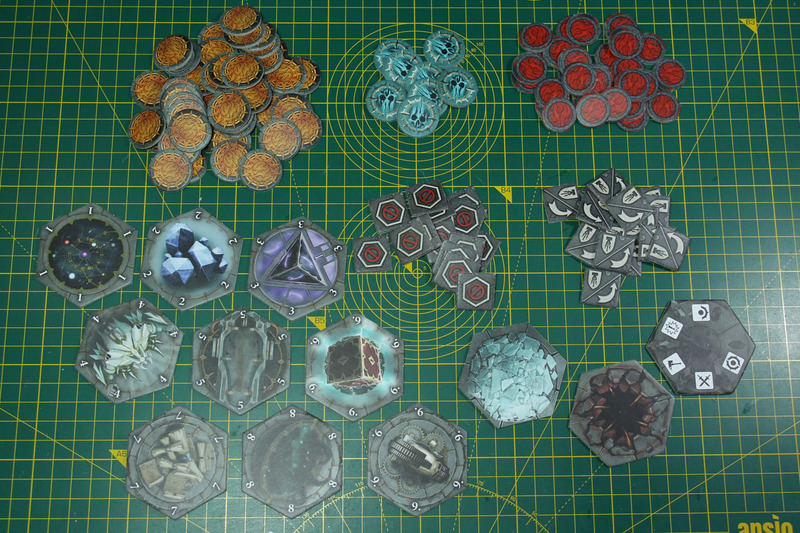 The amount of tokens is identical to the ones from Shadespire, 11 double-sided objective tokens, a scatter template, 30 wound tokens, 46 double-sided glory point tokens, - 15 double-sided move and charge tokens, 15 Guard tokens and 8 activation counters. 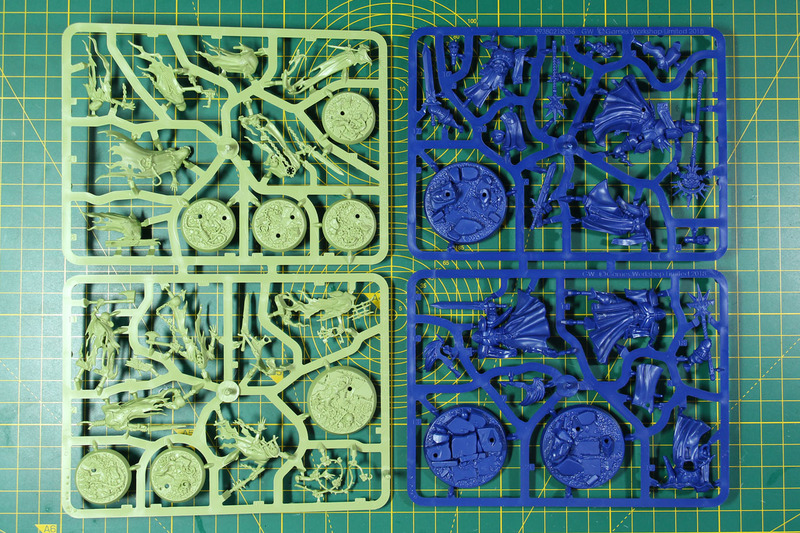 The two warbands included in Nightvault are Stormsire’s Cursebreakers and the Thorns of the Briar Queen, casted in pre-coloured plastic in lime green and blue. 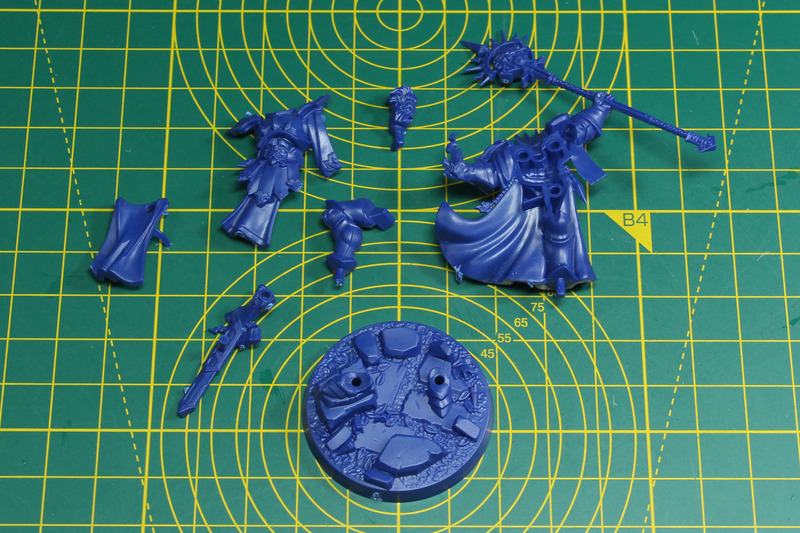 So you can easily identify your miniatures, prior to painting, and it is more appealing than simple grey. 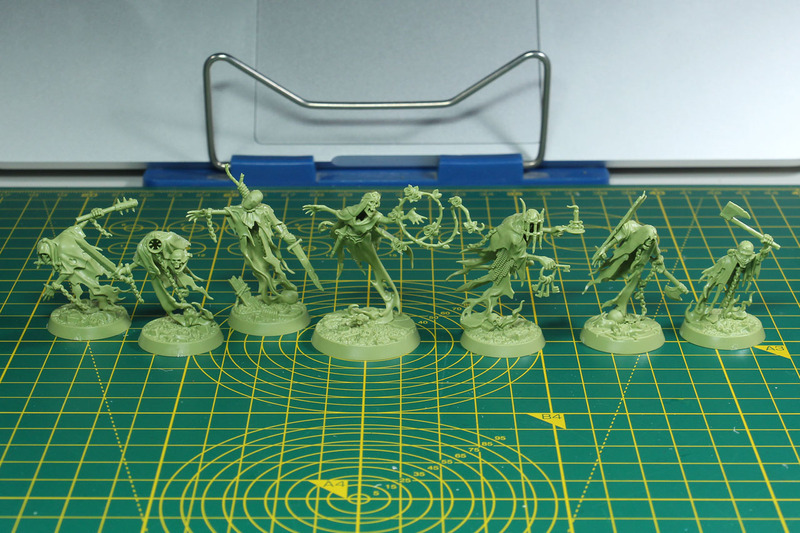 Let's start with assembling the first warband. 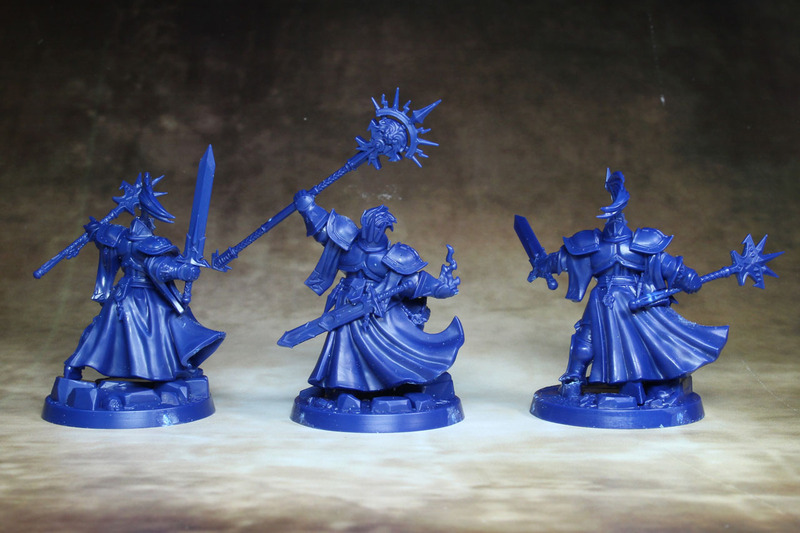 The Stormcast warbands are kept in blue plastic in the Underworld series, so Stormsire's Cursebreakers share that with Steelheart's Champions and the Farstriders. 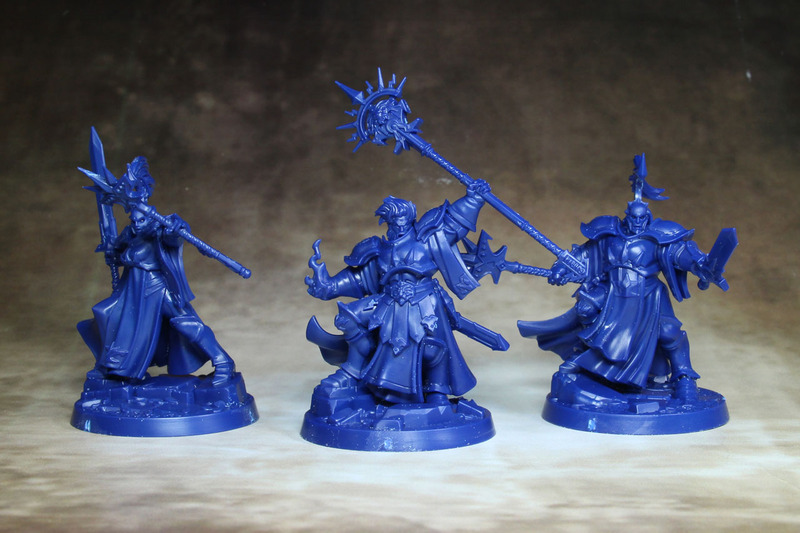 This warband consists out of three models; their leader Averon Stormsire, Ammis Dawnguard and Rastus the Charmed. 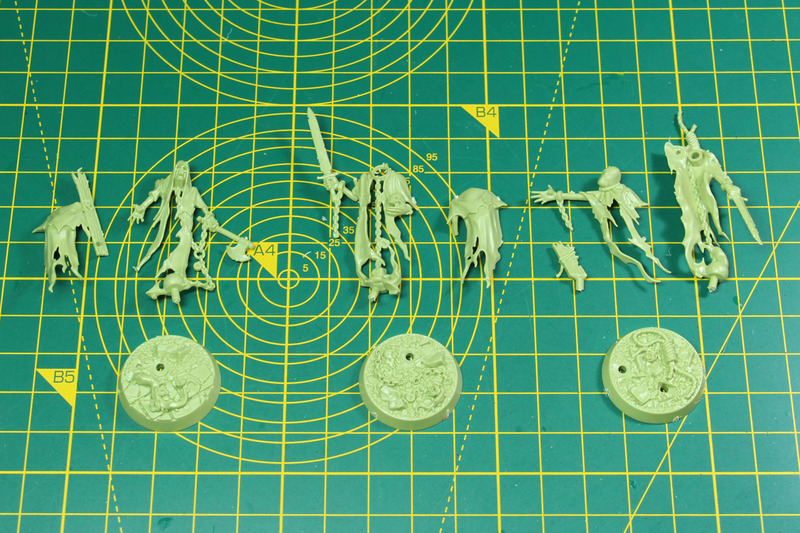 All the miniatures come with designed bases, so all you need to do is assembly and later paint them. No intended need for glue, pva or flock. Assembly is going fast and rather well. Only had problems with putting Rastus on his base. As these miniatures are push-fit, they are held together by friction. Sometimes this may cause a problem and the pin is slightly thicker resulting in a small gap or the need for more force pushing the models together. 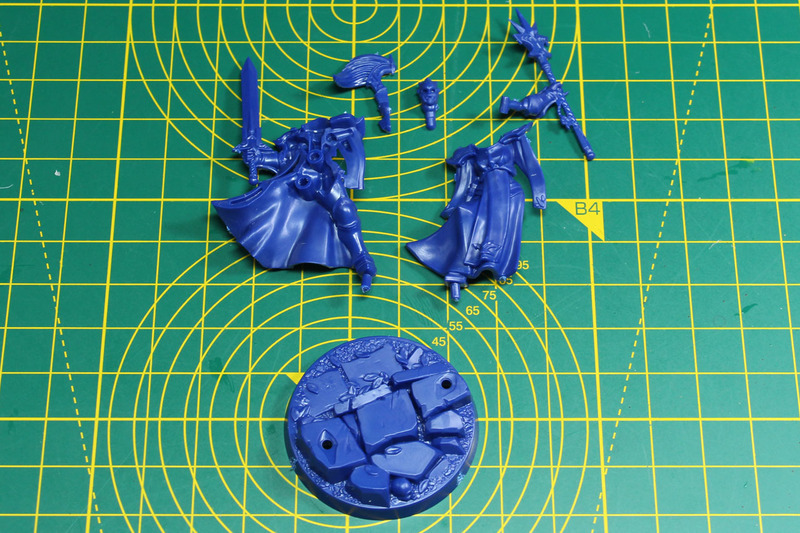 With the thicker parts, that is not that big of a problem, but one some parts of the miniatures, this bears a certain risk to damage to the model itself. Dry-fit is unfortunately not a real options, because once it sticks, it sticks. Therefore, if you have the feeling that there might be a problem, file of the connection bits by a bit and use a drop of plastic glue to keep the pieces in place. 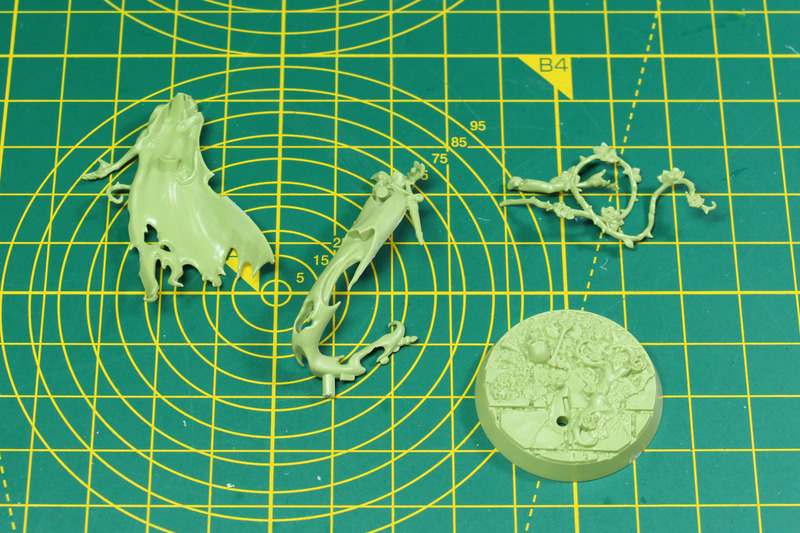 I recommend the use of plastic glue anyway, as it helps close the minor gaps between the individual pieces. The Cursebreakers have very stretched poses, wielding their weapons beyond the areas their bases cover. This causes a very dominant stance and is quite fitting for warriors using the powers of magic. The all carry swords and magic staffs to channel their magic powers. 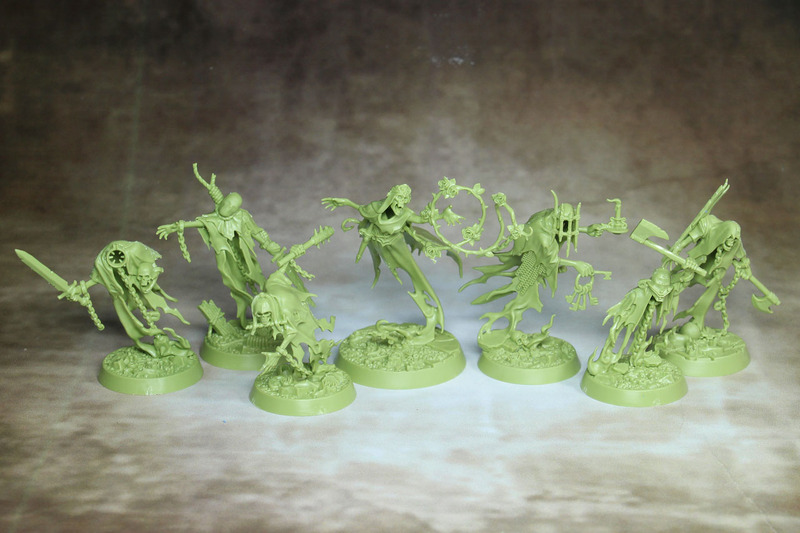 The second warband of Nightvault comes from the faction of the Nighthaunt, introduced with the second edition of Age of Sigmar. 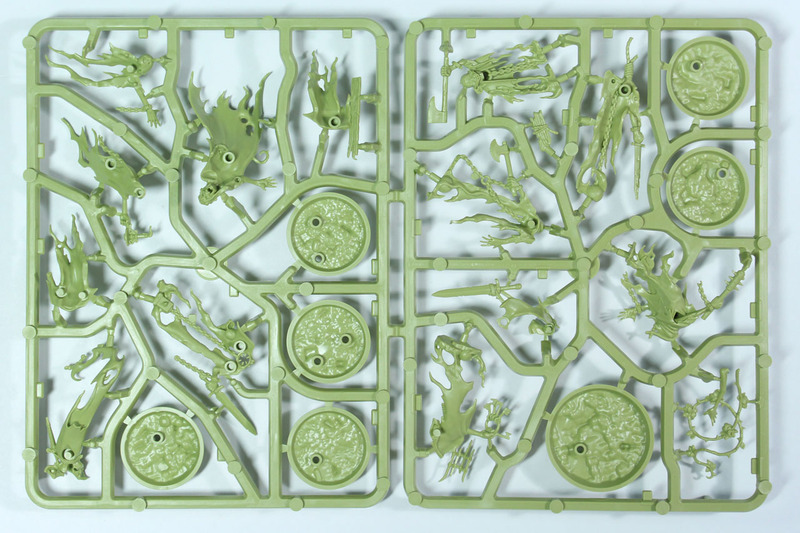 The Thorns of the Briar Queen are made up of 7 miniatures. They have three named characters here, are the Briar Queen herself (she is the leader of the warband), Varclav the Cruel and the Ever-Hanged. Here are the bases designed as well and the fit is quite easy. You have to be careful with some of the details though, as they are delicate and I'd suggest a foam tray inlay for the box or proper miniature case to transport this warband. The Briar Queen is a magic user as well, but the only from the warband. She carries a thorn whip, which gives her a range attack of 2. Varclav wields the warden's blade. The others have an assortment of hand weapons. I like the floating poses of the Nighthaunt. 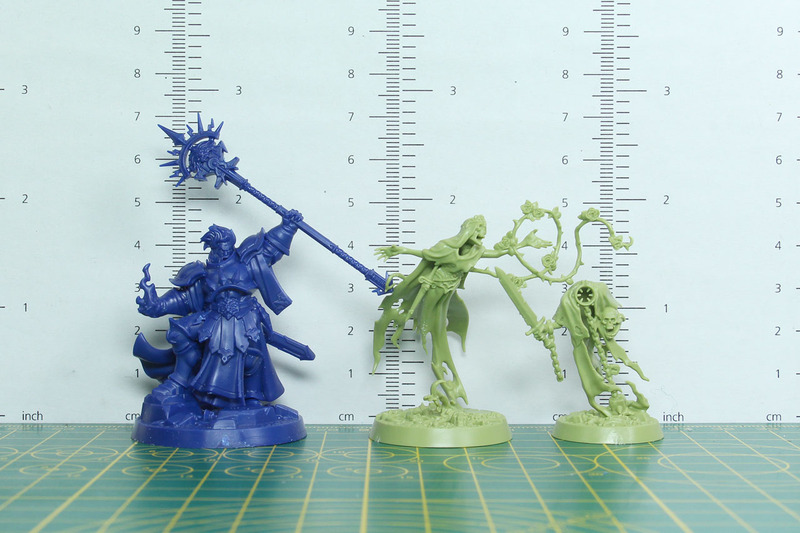 They already caught that very well with the miniatures in the 2nd edition starter box for Age of Sigmar. 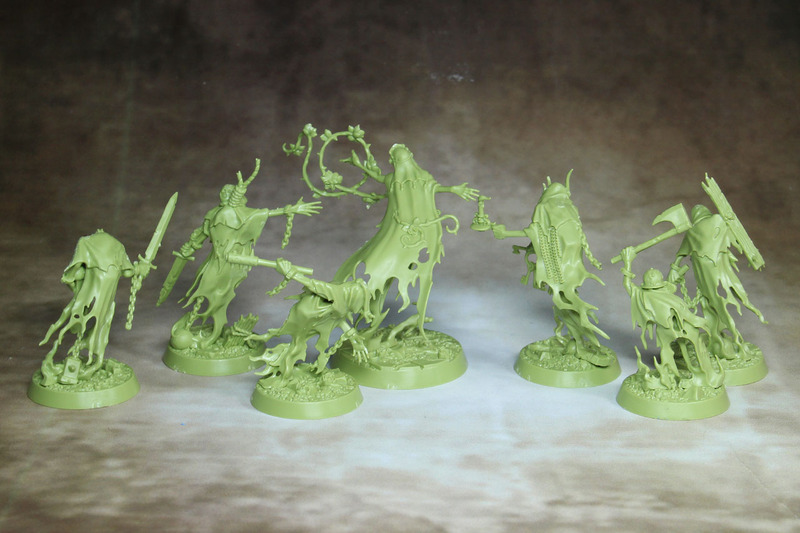 If you go for a ghostly appearance, you could simply drybrush these miniatures in white, but that would be a bit lazy and will most likely look dusty. Otherwise you could give them a white basecoat and use one of the magnificent Citadel glazes on top or use Hexwraith Flame. 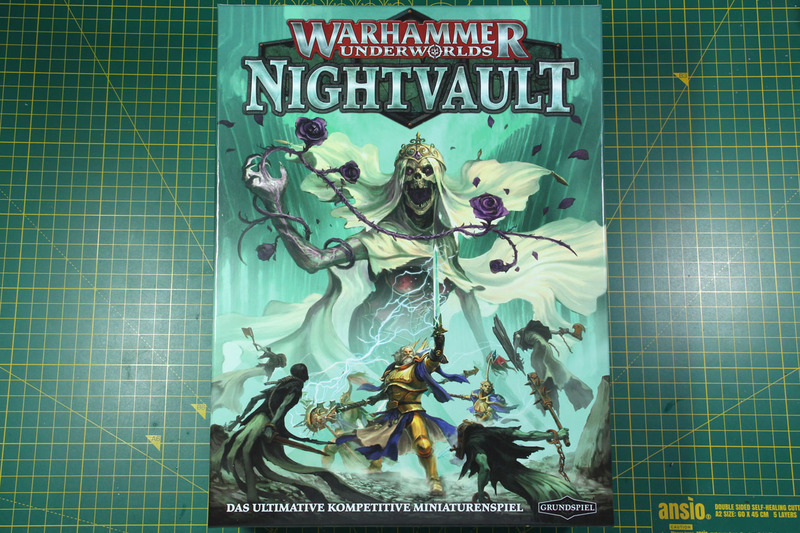 How plays Warhammer Underworlds: Nightvault? Nightvault comes with an 8 page quick start rule set, to aid you into and through your first games. There is a first game set up, between two Stormcasts and three Nighthaunts. The Underworld rules still stay at 3 turns per player with 4 activations each. Each turn is divided into different phases that allow players to use the activations to use their miniatures and the cards on their hand. The combat sequence reminds me of a combination of Heroquest and Blood Bowl. The dice consider the type of weapon and defense equipment, as well as supporting characters on both sides. And as you have a visual result on your dice, it is (or at least feels) easier and faster than regular dice with boni and mali. And this continued with the new addition of magic spells into the weaponry. The rule set is kept at a fast pace and concentrated. Each turn you have four activations that can be used to either move, attack, go into defending stance or to do a special action from his character or upgrade card. Moving is straight forward, you move the miniature as many fields as you like within the movement stat noted on his character card. An attack is similar, you get to role an amount of dice, depending on your weapon / equipment / spell and the attacked character defense using his stats / gear. Comparison of hits, damage is dealt and if the damage is higher than the amount of remaining wounds, the character is out. Those actions benefit from upgrades (cards for example that modify your dice results, deal damage to multiple enemies, etc. ), so it is important to keep an eye on your deck and the possible synergies that you can activate by achieving the mission goals and gathering glory points. In addition characters receive boni when they are inspired. Each character has different conditions for being motivated, for example being wounded, or a certain number of enemies were slain. In case of the warbands from this set, the Cursebreakers need to successfully cast a spell and the Thorns of the Briar Queen need to be in an adjacent hex to an enemy at the beginning of their move. 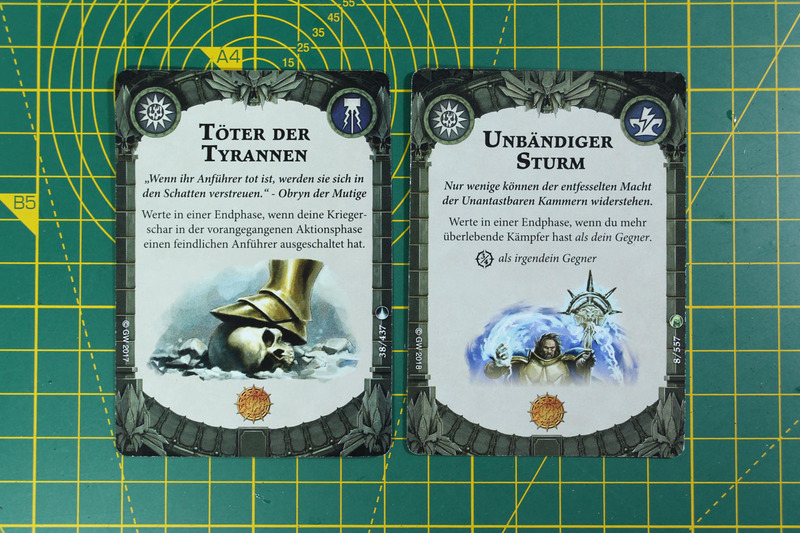 The Underworld ruleset covers asymmetric mission goals that are assigned by drawing cards. The mission goals can be chosen during your deck building, so that they match your play style. Aligning your goals with the strengths of your warband, helps you gather glory points fast and effective, so you can spend these on upgrades for your characters. This gives the game an interesting twist, as it brings motivation beyond the simple arena death match and just annihilation of the enemy warband. Some missions are easier to achieve for some warbands as to others. 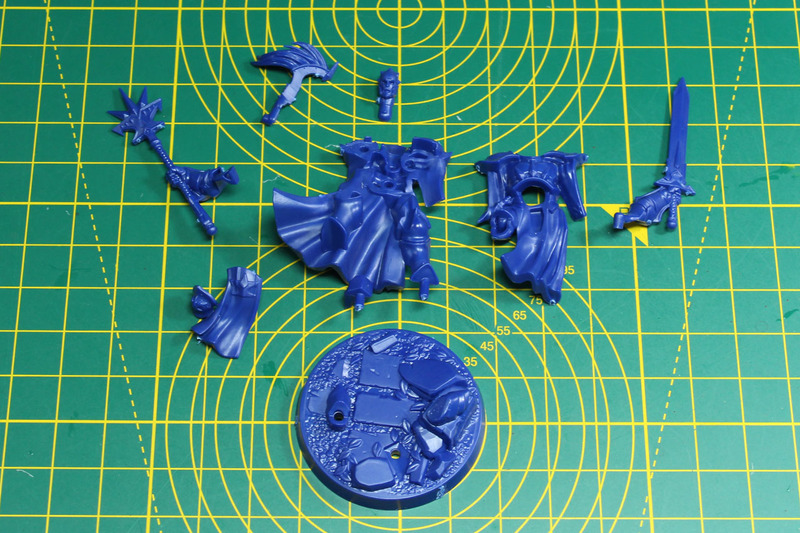 With Nightvault there are some novelties to the Underworld rulesets. As the Farstriders were the first to really cover ranged combat, the Cursebreakers are the first to bring magic spells into the game - all across their warband. This extends the use of ranged combat, but the spells are not just chain lightning or fire balls, but buffs or upgrades as well. Another aspect, which is new with the Nightvault rules is scatter. There is a scatter hex template included that is used for certain actions. The faces of the attack dice is assorted to the directions on the template and you roll the dice for the random orientation of the scatter. Similar to the way scatter was/is handled in the Blood Bowl rule set. 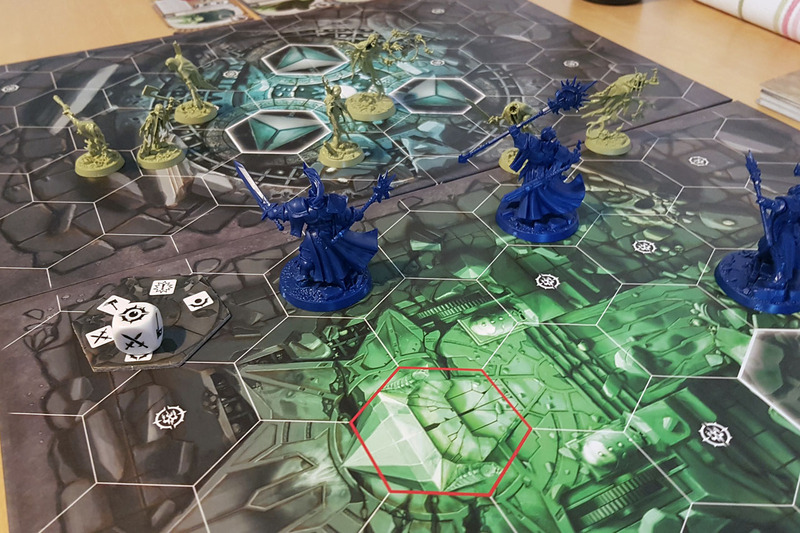 The dangerous hex fields is something that was introduced with the expansion shattered city board back during season 1 / Shadespire, and is now included with the Nightvault boards that are part of the starter kit. The way the boards are laid at the beginning of each game is more strategic than you might assume at first. Depending on your warbands speed (or range), you benefit from a large square, long tunnel or shifted alignment of the two boards. And you will notice how interesting the game becomes after the first few matches, when you open up the third deck and add the new cards to your existing deck. It opens up a more free and dynamic way of adjusting your strategy. The Underworld community page covers a couple of deck builds to help you get started, along with an extensive library of the cards available to the game. Some of the cards you will want to use are part of the expansions / supplement warbands, but you know what you get instead like in a living card game, other than the shuffled boosters of trading card games. This game still is strongly focused on competitive gaming. Maybe even more than before. Organized play is highly supported by the stores and independent retailers. The tournaments (called Grand Clashs) have an interesting price support, ranging from acryl tokens, alternative artworks to shade glass trophies. Ask your local club or store about the details. And the Underworlds rules set covers the opportunity to run multiplayer matches, with up to four players. 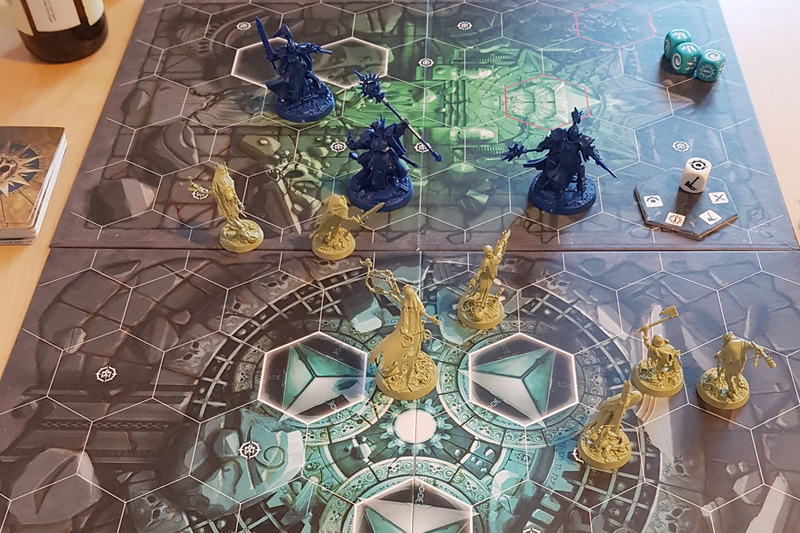 With people continuing the game from Shadespire to Nightvault and thus having 4 game boards of their own, I assume this is something we will see more often. 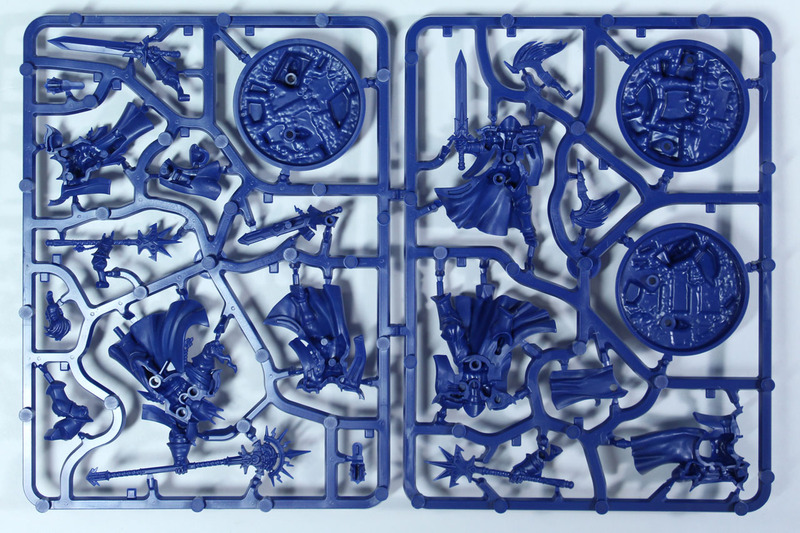 Similar to the "closed wave" of Shadespire, that covered the starter kit and six more warbands (Sepulchral Guard, Ironskull's Boyz, Chosen Axes, Spiteclaws Swarm, Magore's Fiends and the Farstriders), Nightvault will have similar new warbands. That was already announcement - in a rather vague way - at Warhammer Fest Europe. 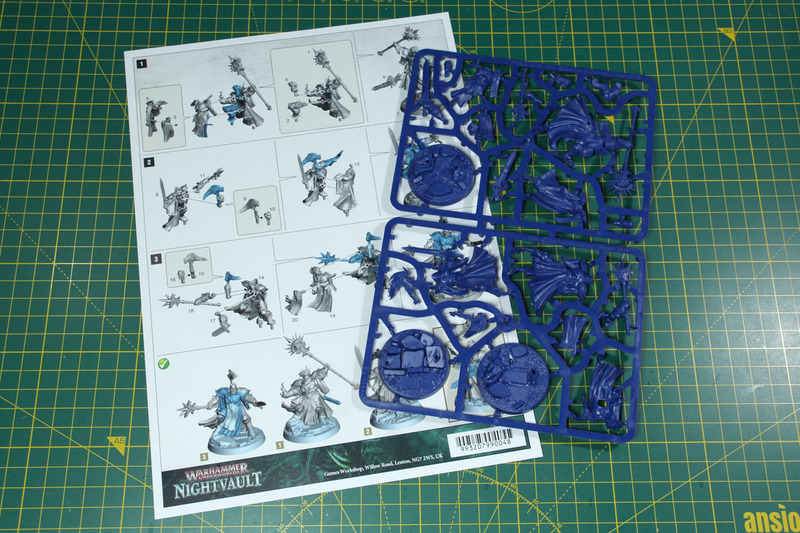 The rumour boards are quite active and even covered the box cover art of the further released warbands of Nightvault and the Warhammer Community page teasered a Moonclan Goblin in armour as well as a Tzaangor as miniatures for these warbands. That clears up two of the six slots. The remaining four will cover the Dark Oath, Sylvaneth, Kharadron Overlords and a yet unnamed nature force, sporting the Troggoth shown in August on Warhammer Community, according to the Lore teaser on Nightvault (YouTube Link). Games Workshop extended the available additional product line for Nightvault compared to Shadespire. 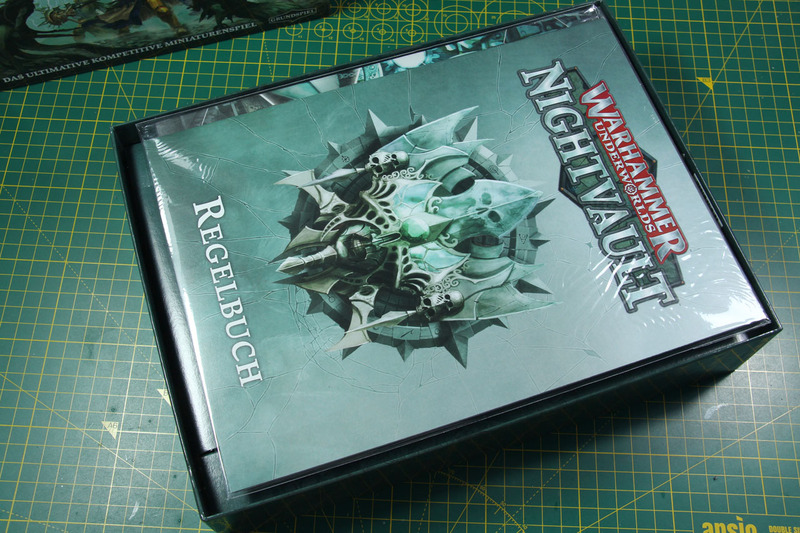 Whereas there were warband specific dice, sleeves for the cards and an additional board, Nightvault also covers a gaming mat (as you might know from competitive card games) and terrain (something we only suggested doing in season one with the Shattered Dominion objectives). The use of terrain is discussed to some degree by the players. 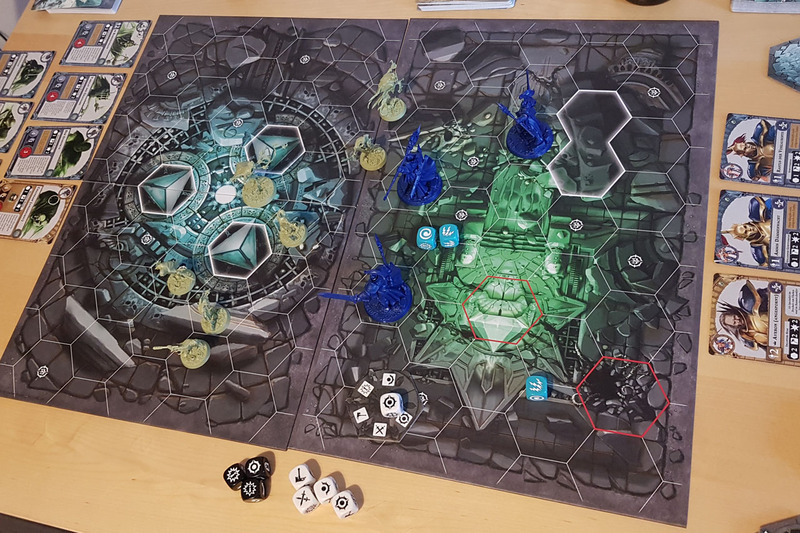 As it was only "troublesome" for objectives, as blocked fields couldn't be used, it is now with the Nighthaunts that can still use these hexes a bit of a hassle. But these are just optional accessories, you do not need them for playing. Most interesting from my point of view is the Deck Box, as these could only be acquired by competitive gaming / participating in events in Season one. 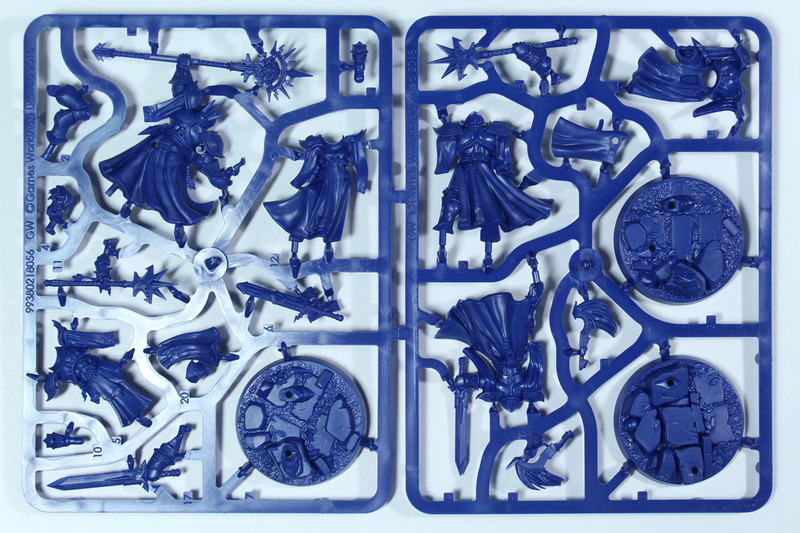 As it is likely that the Shadespire box will be dropped out of production (a topic that wasn't clearly answered yet, as due to contradicting comments by Games Workshop employees but no official statement) in the mid run, the boards from the Shadespire box are already available as an individual product and the two warbands, Steelheart's Champions and Reivers, will be available as regular warbands as well. 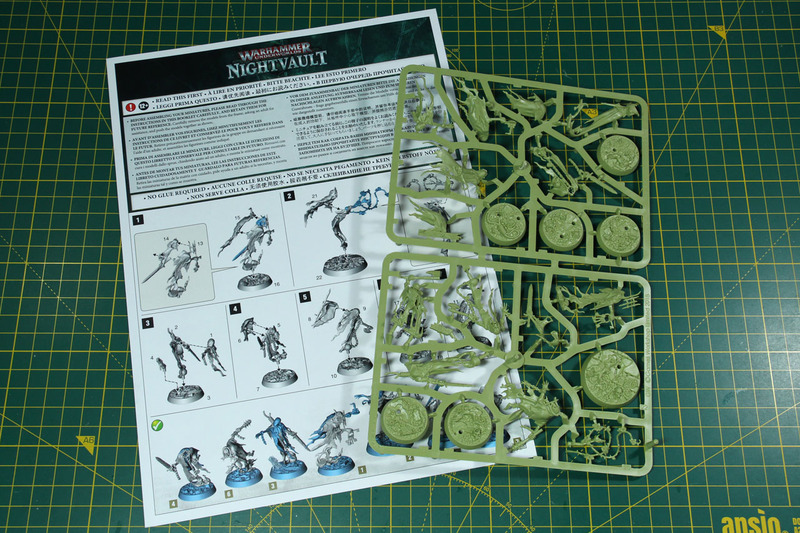 If you are already hooked on the Underworlds rules, want to start with Nightvault, I recommend buying the Shadespire boxed set as well, if you can get your hands on it, as it is a good deal for the content it covers compared to buying the parts individually. You would have 4 warbands to begin with, being more flexible with introducing others to the game and to multiplayer matches. Similar to the first season, Games Workshop supports the game on a broad range. We have an updated How to Play video for Nightvault, now hosted by the newly hired Becca Scott. There went more time into the teasers and lore videos compared to Shadespire. 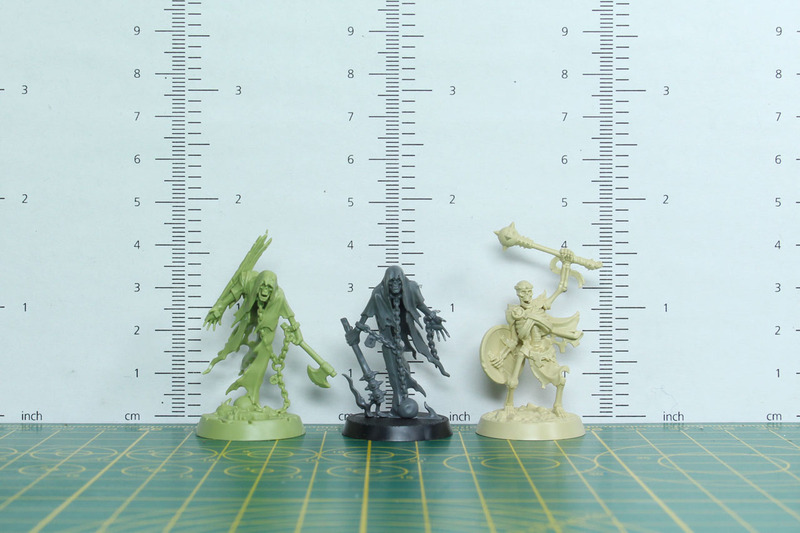 As the Stormcasts and Nighthaunts are part of the regular Age of Sigmar range and especially of the several introduction sets and starter boxes, there is a broad range of painting videos on WarhammerTV as well. And there are several videos Underworld / Nightvault related on the Twitch channel of WarhammerTV as well. 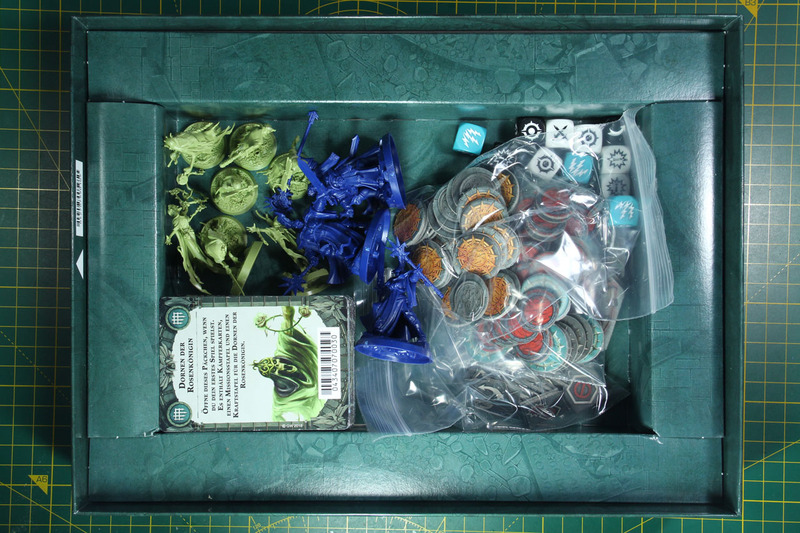 A nice thing with the Nightvault box that they already did with the Shadespire and picked up from more sophisticated board games is the addition of small bags for your tokens and items. Makes storing much easier and less messy. And all the content fits into the box once it is assembled. Nothing you should take for granted. But I suggest getting a foam tray for your warbands. 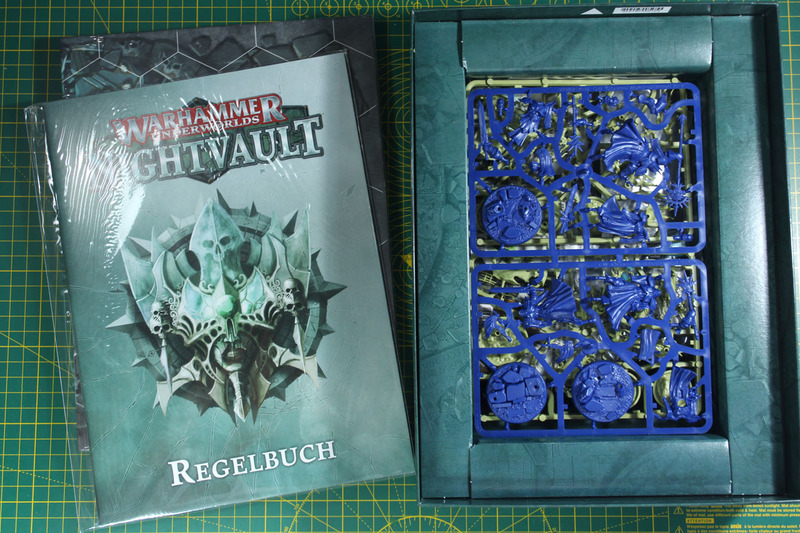 I did so with the Shadespire box, as you can see in the second picture and am currently waiting for Feldherr to release a new one matching the Nightvault set up. 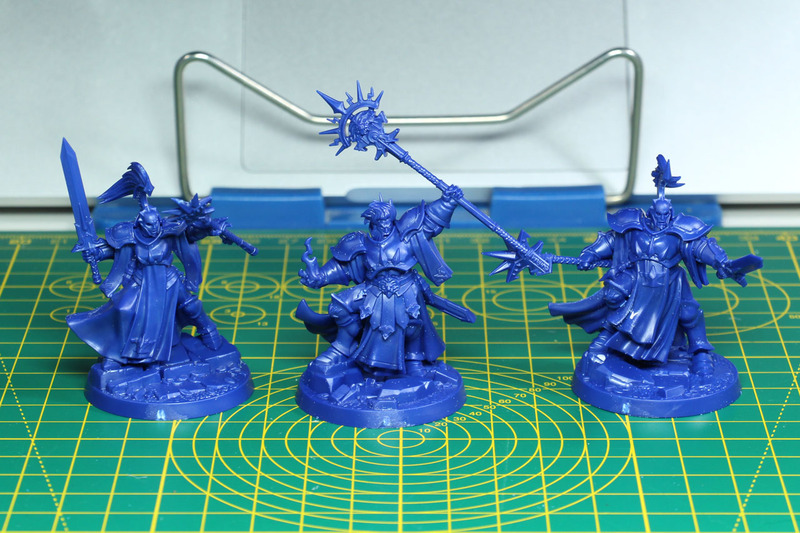 To be honest, with Nightvault is even more needed to do so, than with Shadespire, as the expanded poses of the Cursebreakers and delicate details of the Thorns of the Briar Queen miniatures need that care. A brief comparison of the greatly done miniatures of this kit. You can see, the Stormcasts are huge and among the most impressive miniatures of the whole Underworld range with their heroic poses. 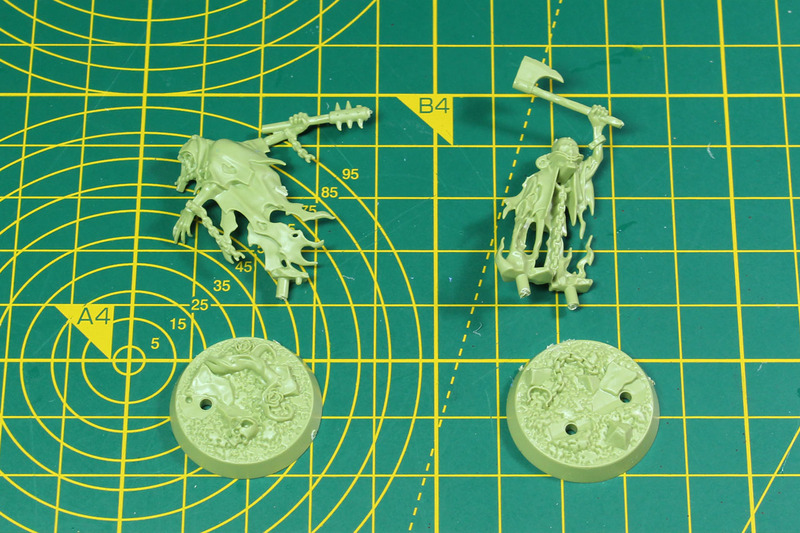 As the Underworld miniatures are (mostly) available as easy-to-build kits for Age of Sigmar as well, these of course fit the regular Warhammer range as well. 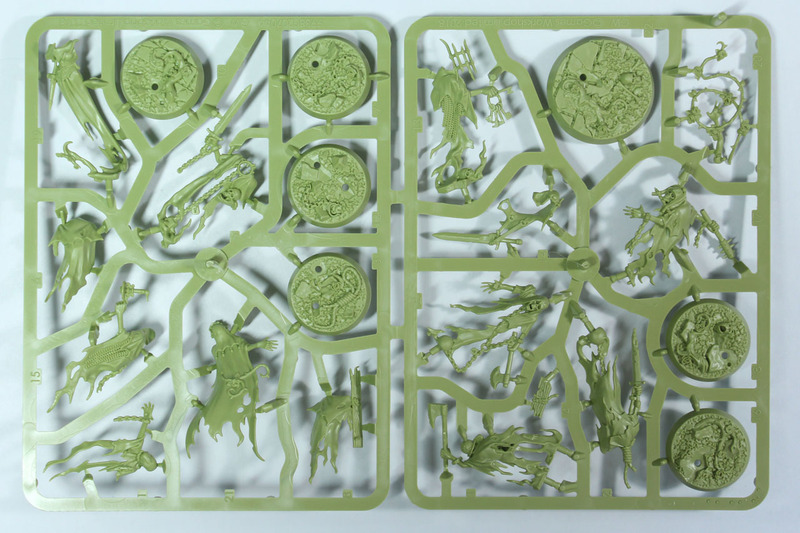 And the last two rows of images cover the assembled warbands of Stormsire's Cursebreakers and the Thorns of the Briar Queen. Nightvault keeps the old price tag of the Shadespire starter set of 40 GBP / 50 EUR, therefore I assume that the supplement warbands will still be 17,50 GBP / 22,50 EUR. I like that they kept the price range, as it is reasonable and an easy to manage price for most wargamers and those who want to be. The last season, covering all 8 warbands, set you back 145 GBP or 185 EUR, and I assume the second wave to be in that area as well - if you want to have access to all the decks /cards and warbands. Compared to trading card games, that's around two displays per year, and here we have the advantage of a not random assignment of the content to boosters. 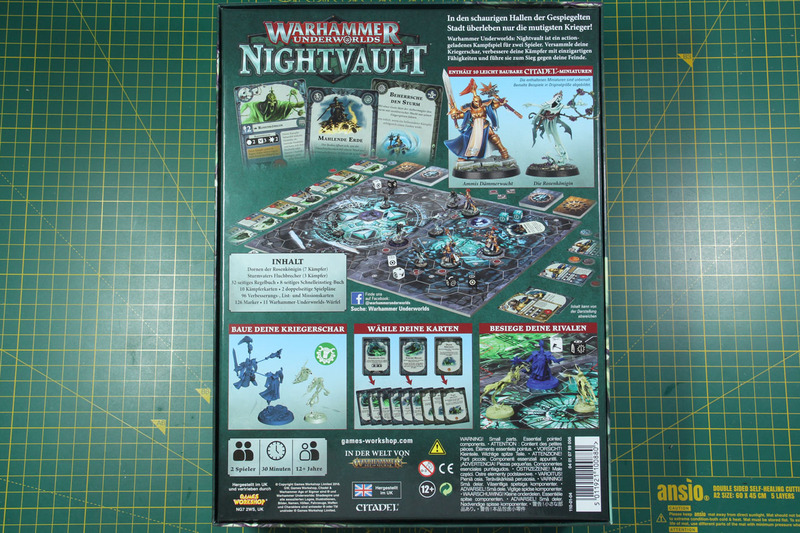 As a board game Nightvault is on the same interesting level as Shadespire was. Moved a bit ahead with the addition of magic and the introduction of new warbands of course. So for those who only have a limited amount of gaming time and space, but want to still be part of the miniature gaming, the Underworld series is of certain interest. The amount of time you need to prepare these closed warbands is absolutely calculable and you can easily get 3-4 games played on even a short game night. 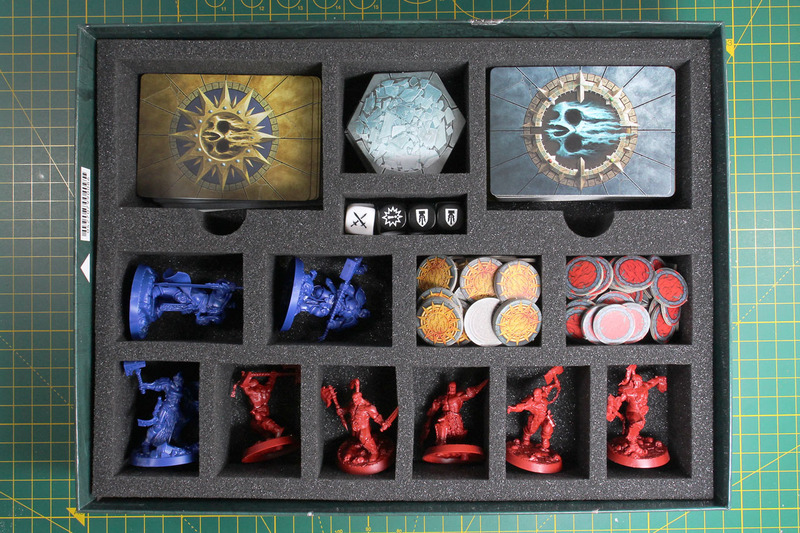 Perfect product for a gaming dad like myself, put my warband and deck in a small miniature case and drop by after work in one of the local stores gaming evenings. As for competitive gamers it still is an interesting aspect, as you have the newly expanded deck building aspect, with new cards to use and new deck builds to try out. Along with 8 new warbands for season two, that will have new interesting possibilities and game styles. There is currently a bit of uncertainty on the compatibility and balance of Shadespire cards and decks with the new Nightvault season, but that is something that always comes up when new aspects are introduced into a competitive surrounding. I assume that for the competitive gamers it is more important, that the game stays calculable and lean, with not too many new mechanics added to get game. So far the only thing that actually strayed "far" (if you even want to call it that) from that, was the Leader's deck. We will see what the new season brings. Other than that, the tournament scene for Underworld is absolutely interesting as the entry level barrier is low and the prices are appealing, as there is strong support even for smaller events. So to sum it up, what appeals to me with Underworld are a couple of things. It is compact. I have the whole game in the box, no need for additional terrain. It has a low miniature count, so it is even for slow painters do-able. That is a pro argument for newcomers as well, as it is a good way to get to know the miniature hobby without starting head over heels with a whole army etc.. And with the different warbands I have the chance to play and paint a couple nice miniatures, without starting a whole new army. It does not need to be competitive and it does not take ages to set up and / or play. 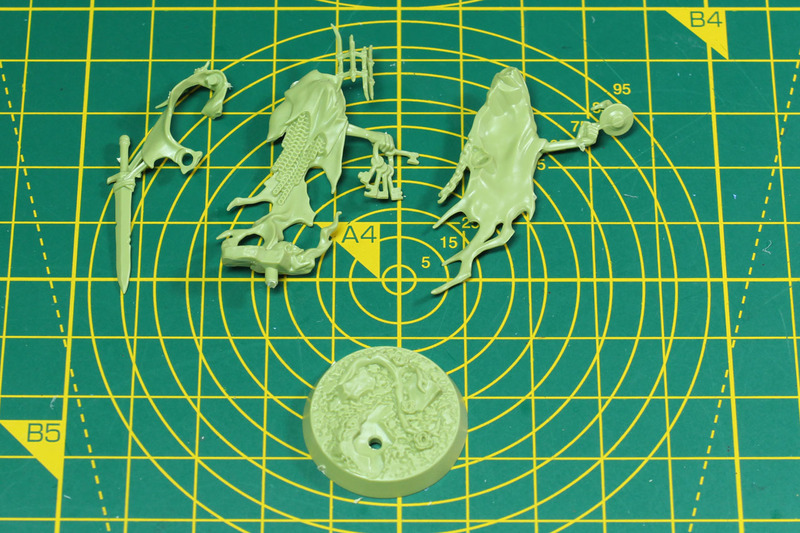 And if the Underworlds rules should not speak to you, for what reason ever, most of the miniatures from the range are available as easy-to-build kits, with the warbands mostly being large enough to be played using the Age of Sigmar Skirmish rule set.